For other uses, see Lisbon (disambiguation). "Lisboa" redirects here. For other uses, see Lisboa (disambiguation). Lisbon (/ˈlɪzbən/; Portuguese: Lisboa, IPA: [liʒˈboɐ] ( listen)) is the capital and the largest city of Portugal, with an estimated population of 505,526 within its administrative limits in an area of 100.05 km2. 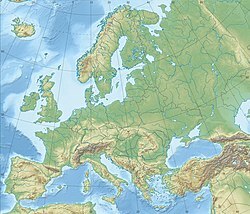 Its urban area extends beyond the city's administrative limits with a population of around 2.8 million people, being the 11th-most populous urban area in the European Union. About 3 million people live in the Lisbon Metropolitan Area, including the Portuguese Riviera, (which represents approximately 27% of the country's population). It is mainland Europe's westernmost capital city and the only one along the Atlantic coast. Lisbon lies in the western Iberian Peninsula on the Atlantic Ocean and the River Tagus. The westernmost areas of its metro area form the westernmost point of Continental Europe, which is known as Cabo da Roca, located in the Sintra Mountains. Clockwise, from top: Eduardo VII Park, Commerce Square with the Alfama district, the Sé de Lisboa, panoramic view of the city from São Jorge Castle with the 25 de Abril Bridge at background, the Belém Tower and the Parque das Nações with the Vasco da Gama Bridge at background. Lisbon is recognised as an alpha-level global city by the Globalization and World Cities (GaWC) Study Group because of its importance in finance, commerce, media, entertainment, arts, international trade, education and tourism. Lisbon is the only Portuguese city besides Porto to be recognised as a global city. It is one of the major economic centres on the continent, with a growing financial sector and one of the largest container ports on Europe's Atlantic coast. Additionally, Humberto Delgado Airport served 26.7 million passengers in 2017, being the busiest airport in Portugal, the 3rd busiest in the Iberian Peninsula and the 20th busiest in Europe, and the motorway network and the high-speed rail system of Alfa Pendular links the main cities of Portugal (such as Braga, Porto and Coimbra) to Lisbon. The city is the 9th-most-visited city in Southern Europe, after Rome, Istanbul, Barcelona, Milan, Venice, Madrid, Florence and Athens, with 3,320,300 tourists in 2017. The Lisbon region contributes with a higher GDP PPP per capita than any other region in Portugal. Its GDP amounts to 96.3 billion USD and thus $32,434 per capita. The city occupies the 40th place of highest gross earnings in the world. Most of the headquarters of multinational corporations in Portugal are located in the Lisbon area. It is also the political centre of the country, as its seat of Government and residence of the Head of State. Lisbon is one of the oldest cities in the world, and one of the oldest in Western Europe, predating other modern European capitals such as London, Paris, and Rome by centuries. Julius Caesar made it a municipium called Felicitas Julia, adding to the name Olissipo. Ruled by a series of Germanic tribes from the 5th century, it was captured by the Moors in the 8th century. In 1147, the Crusaders under Afonso Henriques reconquered the city and since then it has been a major political, economic and cultural centre of Portugal. Unlike most capital cities, Lisbon's status as the capital of Portugal has never been granted or confirmed officially – by statute or in written form. Its position as the capital has formed through constitutional convention, making its position as de facto capital a part of the Constitution of Portugal. One claim often repeated in non-academic literature is that the name of Lisbon can be traced back to Phoenician times, referring to a supposedly Phoenician term Alis-Ubo, meaning "safe harbour". Roman authors of the first century AD referred to popular legends that the city of Lisbon was founded by the mythical hero Odysseus on his journey home from Troy. Although modern archaeological excavations show a Phoenician presence at this location since 1200 BC, neither of these folk etymologies has any historical credibility. Lisbon's origin may in fact derive from Proto-Celtic or Celtic Olisippo, Lissoppo, or a similar name which other visiting peoples like the Ancient Phoenicians, Greeks and Romans adapted accordingly. The name of the settlement may be derived from the pre-Roman appellation for the Tagus River, Lisso or Lucio. Lisbon's name was written Ulyssippo in Latin by the geographer Pomponius Mela, a native of Hispania. It was later referred to as "Olisippo" by Pliny the Elder and by the Greeks as Olissipo (Ὀλισσιπών) or Olissipona (Ὀλισσιπόνα). Lisbon's name is commonly abbreviated to 'LX' or 'Lx', originating in an antiquated spelling of Lisbon as ‘’Lixbõa’’. While the old spelling has since been completely dropped from usage and goes against modern language standards, the abbreviation is still commonly used. During the Neolithic period, the region was inhabited by Pre-Celtic tribes, who built religious and funerary monuments, megaliths, dolmens and menhirs, which still survive in areas on the periphery of Lisbon. The Indo-European Celts invaded in the 1st millennium BC, mixing with the Pre-Indo-European population, thus giving rise to Celtic-speaking local tribes such as the Cempsi. Although the first fortifications on Lisbon's Castelo hill are known to be no older than the 2nd century BC, recent archaeological finds have shown that Iron Age people occupied the site from the 8th to 6th centuries BC. This indigenous settlement maintained commercial relations with the Phoenicians, which would account for the recent findings of Phoenician pottery and other material objects. Archaeological excavations made near the Castle of São Jorge (Castelo de São Jorge) and Lisbon Cathedral indicate a Phoenician presence at this location since 1200 BC, and it can be stated with confidence that a Phoenician trading post stood on a site now the centre of the present city, on the southern slope of the Castle hill. The sheltered harbour in the Tagus River estuary was an ideal spot for an Iberian settlement and would have provided a secure harbour for unloading and provisioning Phoenician ships. The Tagus settlement was an important centre of commercial trade with the inland tribes, providing an outlet for the valuable metals, salt and salted-fish they collected, and for the sale of the Lusitanian horses renowned in antiquity. According to legend, the location was named for the mythical Ulysses, who founded the settlement after he left Troy to escape the Greek coalition. Later, the Greek name appeared in Vulgar Latin in the form Olissipona. Following the defeat of Hannibal in 202 BC during the Punic wars, the Romans determined to deprive Carthage of its most valuable possession: Hispania (the Iberian Peninsula). The defeat of Carthaginian forces by Scipio Africanus in Eastern Hispania allowed the pacification of the west, led by Consul Decimus Junius Brutus Callaicus. Decimus obtained the alliance of Olissipo (which sent men to fight alongside the Roman Legions against the northwestern Celtic tribes) by integrating it into the empire, as the Municipium Cives Romanorum Felicitas Julia. Local authorities were granted self-rule over a territory that extended 50 kilometres (31 miles); exempt from taxes, its citizens were given the privileges of Roman citizenship, and it was then integrated with the Roman province of Lusitania (whose capital was Emerita Augusta). Lusitanian raids and rebellions during Roman occupation required the construction of a wall around the settlement. During Augustus' reign, the Romans also built a great theatre; the Cassian Baths (underneath Rua da Prata); temples to Jupiter, Diana, Cybele, Tethys and Idea Phrygiae (an uncommon cult from Asia Minor), in addition to temples to the Emperor; a large necropolis under Praça da Figueira; a large forum and other buildings such as insulae (multi-storied apartment buildings) in the area between the Castle Hill and the historic city core. Many of these ruins were first unearthed during the mid-18th century (when the recent discovery of Pompeii made Roman archaeology fashionable among Europe's upper classes). The city prospered as piracy was eliminated and technological advances were introduced, consequently Felicitas Julia became a centre of trade with the Roman provinces of Britannia (particularly Cornwall) and the Rhine. Economically strong, Olissipo was known for its garum (a fish sauce highly prized by the elites of the empire and exported in amphorae to Rome), wine, salt and horse-breeding, while Roman culture permeated the hinterland. The city was connected by a broad road to Western Hispania's two other large cities, Bracara Augusta in the province of Tarraconensis (Portuguese Braga), and Emerita Augusta, the capital of Lusitania. The city was ruled by an oligarchical council dominated by two families, the Julii and the Cassiae, although regional authority was administered by the Roman Governor of Emerita or directly by Emperor Tiberius. Among the majority of Latin speakers lived a large minority of Greek traders and slaves. Around 80 BC, the Roman Quintus Sertorius led a rebellion against the dictator Sulla. During this period, he organised the tribes of Lusitania and Hispania and was on the verge of forming an independent province in the Sertorian War when he was assassinated. Olissipo, like most great cities in the Western Empire, was a centre for the dissemination of Christianity. Its first attested Bishop was Potamius (c. 356), and there were several martyrs during the period of persecution of the Christians: Maxima, Verissimus and Eulalia of Mérida are the most significant examples. By the time of the Fall of Rome, Olissipo had become a notable Christian centre. Following the disintegration of the Western Roman Empire there were barbarian invasions; between 409 and 429 the city was occupied successively by Sarmatians, Alans and Vandals. The Germanic Suebi, who established a kingdom in Gallaecia (modern Galicia and northern Portugal), with its capital in Bracara Augusta, also controlled the region of Lisbon until 585. In 585, the Suebi Kingdom was integrated into the Germanic Visigothic Kingdom of Toledo, which comprised all of the Iberian Peninsula: Lisbon was then called Ulishbona. On 6 August 711, Lisbon was taken by Muslim forces. These conquerors, who were mostly Berbers and Arabs from North Africa and the Middle East, built many mosques and houses, rebuilt the city wall (known as the Cerca Moura) and established administrative control, while permitting the diverse population (Muladi, Mozarabs, Berbers, Arabs, Jews, Zanj and Saqaliba) to maintain their socio-cultural lifestyles. Mozarabic was the native language spoken by most of the Christian population although Arabic was widely known as spoken by all religious communities. Islam was the official religion practised by the Arabs, Berbers, Zanj, Saqaliba and Muladi (muwalladun). The Muslim influence is still visible present in the Alfama district, an old quarter of Lisbon that survived the 1755 Lisbon earthquake: many place-names are derived from Arabic and the Alfama (the oldest existing district of Lisbon) was derived from the Arabic "al-hamma". For a brief time, Lisbon was an independent Muslim kingdom known as the Taifa of Lisbon, before being conquered by the larger Taifa of Badajoz in 1094. In 1108 Lisbon was raided and occupied by Norwegian crusaders led by Sigurd I on their way to the Holy Land as part of the Norwegian Crusade and occupied by crusader forces for three years. It was taken by the Moorish Almoravids in 1111. In 1147, as part of the Reconquista, crusader knights led by Afonso I of Portugal besieged and conquered Lisbon. The city, with around 154,000 residents at the time, was returned to Christian rule. The reconquest of Portugal and re-establishment of Christianity is one of the most significant events in Lisbon's history, described in the chronicle Expugnatione Lyxbonensi, which describes, among other incidents, how the local bishop was killed by the crusaders and the city's residents prayed to the Virgin Mary as it happened. Some of the Muslim residents converted to Roman Catholicism, and most of those who did not convert fled to other parts of the Islamic world, primarily Muslim Spain and North Africa. All mosques were either completely destroyed or converted into churches. As a result of the end of Muslim rule, spoken Arabic quickly lost its place in the everyday life of the city and disappeared altogether. With its central location, Lisbon became the capital city of the new Portuguese territory in 1255. The first Portuguese university was founded in Lisbon in 1290 by King Denis I; for many years the Studium Generale (General Study) was transferred intermittently to Coimbra, where it was installed permanently in the 16th century as the University of Coimbra. In 1384, the city was besieged by King Juan I of Castille, as a part of the ongoing 1383–1385 Crisis. The result of the siege was a victory for the Portuguese led by Nuno Álvares Pereira. During the last centuries of the Middle Ages, the city expanded substantially and became an important trading post with both Northern European and Mediterranean cities. Most of the Portuguese expeditions of the Age of Discovery left Lisbon during the period from the end of the 15th century to the beginning of the 17th century, including Vasco da Gama's expedition to India in 1498. In 1506, 3,000 Jews were massacred in Lisbon. 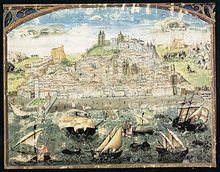 The 16th century was Lisbon's golden era: the city was the European hub of commerce between Africa, India, the Far East and later, Brazil, and acquired great riches by exploiting the trade in spices, slaves, sugar, textiles and other goods. This period saw the rise of the exuberant Manueline style in architecture, which left its mark in many 16th-century monuments (including Lisbon's Belém Tower and Jerónimos Monastery, which were declared UNESCO World Heritage Sites). A description of Lisbon in the 16th century was written by Damião de Góis and published in 1554. The succession crisis of 1580, initiated a sixty-year period of dual monarchy in Portugal and Spain under the Spanish Habsburgs. This is referred to as the "Philippine Dominion" (Domínio Filipino), since all three Spanish kings during that period were called Philip (Filipe). In 1589 Lisbon was the target of an incursion by the English Armada led by Francis Drake, while Queen Elizabeth supported a Portuguese pretender in Antonio, Prior of Crato, but support for Crato was lacking and the expedition was a failure. The Portuguese Restoration War, which began with a coup d'état organised by the nobility and bourgeoisie in Lisbon and executed on 1 December 1640, restored Portuguese independence. The period from 1640 to 1668 was marked by periodic skirmishes between Portugal and Spain, as well as short episodes of more serious warfare, until the Treaty of Lisbon was signed in 1668. In the early 18th century, gold from Brazil allowed King John V to sponsor the building of several Baroque churches and theatres in the city. Ribeira Palace and Lisbon society, in 1662 – by Dirk Stoop. Prior to the 18th century, Lisbon had experienced several significant earthquakes – eight in the 14th century, five in the 16th century (including the 1531 earthquake that destroyed 1,500 houses and the 1597 earthquake in which three streets vanished), and three in the 17th century. On 1 November 1755, the city was destroyed by another devastating earthquake, which killed an estimated 30,000 to 40,000 Lisbon residents of a population estimated at between 200,000 and 275,000, and destroyed 85 percent of the city's structures. Among several important buildings of the city, the Ribeira Palace and the Hospital Real de Todos os Santos were lost. In coastal areas, such as Peniche, situated about 80 km (50 mi) north of Lisbon, many people were killed by the following tsunami. By 1755, Lisbon was one of the largest cities in Europe; the catastrophic event shocked the whole of Europe and left a deep impression on its collective psyche. Voltaire wrote a long poem, Poême sur le désastre de Lisbonne, shortly after the quake, and mentioned it in his 1759 novel Candide (indeed, many argue that this critique of optimism was inspired by that earthquake). Oliver Wendell Holmes, Sr. also mentions it in his 1857 poem, The Deacon's Masterpiece, or The Wonderful One-Hoss Shay. The Marquis of Pombal's enlightened plans for rebuilding Lisbon. After the 1755 earthquake, the city was rebuilt largely according to the plans of Prime Minister Sebastião José de Carvalho e Melo, the 1st Marquess of Pombal; the lower town began to be known as the Baixa Pombalina (Pombaline central district). Instead of rebuilding the medieval town, Pombal decided to demolish what remained after the earthquake and rebuild the city centre in accordance with principles of modern urban design. It was reconstructed in an open rectangular plan with two great squares: the Praça do Rossio and the Praça do Comércio. The first, the central commercial district, is the traditional gathering place of the city and the location of the older cafés, theatres and restaurants; the second became the city's main access to the River Tagus and point of departure and arrival for seagoing vessels, adorned by a triumphal arch (1873) and monument to King Joseph I. The construction of Rossio Station at Pedro IV Square, in 1886. In the first years of the 19th century, Portugal was invaded by the troops of Napoléon Bonaparte, forcing Queen Maria I and Prince-Regent John (future John VI) to flee temporarily to Brazil. By the time the new King returned to Lisbon, many of the buildings and properties were pillaged, sacked or destroyed by the invaders. During the 19th century, the Liberal movement introduced new changes into the urban landscape. The principal areas were in the Baixa and along the Chiado district, where shops, tobacconists shops, cafés, bookstores, clubs and theatres proliferated. The development of industry and commerce determined the growth of the city, seeing the transformation of the Passeio Público, a Pombaline era park, into the Avenida da Liberdade, as the city grew farther from the Tagus. Lisbon was the site of the regicide of Carlos I of Portugal in 1908, an event which culminated two years later in the First Republic. The city refounded its university in 1911 after centuries of inactivity in Lisbon, incorporating reformed former colleges and other non-university higher education schools of the city (such as the Escola Politécnica – now Faculdade de Ciências). Today there are two public universities in the city (University of Lisbon and New University of Lisbon), a public university institute (ISCTE - Lisbon University Institute) and a polytechnic institute (IPL – Instituto Politécnico de Lisboa). The Proclamation of the Portuguese Republic in Lisbon's Municipal Square in 1910. During World War II, Lisbon was one of the very few neutral, open European Atlantic ports, a major gateway for refugees to the U.S. and a haven for spies. More than 100,000 refugees were able to flee Nazi Germany via Lisbon. During the Estado Novo regime (1926–1974), Lisbon was expanded at the cost of other districts within the country, resulting in nationalist and monumental projects. New residential and public developments were constructed; the zone of Belém was modified for the 1940 Portuguese Exhibition, while along the periphery new districts appeared to house the growing population. The inauguration of the bridge over the Tagus allowed rapid connection between both sides of the river. 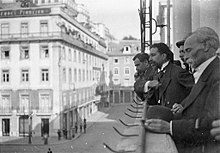 Lisbon was the site of three revolutions in the 20th century. The first, the 5 October 1910 revolution, brought an end to the Portuguese monarchy and established the highly unstable and corrupt Portuguese First Republic. The 6 June 1926 revolution would see the end of that first republic and firmly establish the Estado Novo, or the Portuguese Second Republic, as the ruling regime. The final revolution, the Carnation Revolution, would take place on 25 April 1974 and would end the right-wing Estado Novo and reform the country as the current Portuguese Third Republic. The Treaty of Lisbon was signed at the Jerónimos Monastery in 2007. In the 1990s, many of the districts were renovated and projects in the historic quarters were established to modernise those areas; architectural and patrimonial buildings were renovated; the northern margin of the Tagus was re-purposed for leisure and residential use; the Vasco da Gama Bridge was constructed; and the eastern part of the municipality was re-purposed for Expo '98, to commemorate the 500th anniversary of Vasco da Gama's sea voyage to India, a voyage that would bring immense riches to Lisbon and cause many of Lisbon's landmarks to be built. In 1988, a fire in the historical district of Chiado saw the destruction of many 18th-century Pombaline style buildings. A series of restoration works has brought the area back to its former self and made it a high-scale shopping district. The Lisbon Agenda was a European Union agreement on measures to revitalise the EU economy, signed in Lisbon in March 2000. In October 2007 Lisbon hosted the 2007 EU Summit, where agreement was reached regarding a new EU governance model. The resulting Treaty of Lisbon was signed on 13 December 2007 and came into force on 1 December 2009. Lisbon has been the site for many international events and programmes. In 1994, Lisbon was the European Capital of Culture. On 3 November 2005, Lisbon hosted the MTV European Music Awards. On 7 July 2007, Lisbon held the ceremony of the "New 7 Wonders Of The World" election, in the Luz Stadium, with live transmission for millions of people all over the world. Every two years, Lisbon hosts the Rock in Rio Lisboa Music Festival, one of the largest in the world. Lisbon hosted the NATO summit (19–20 November 2010), a summit meeting that is regarded as a periodic opportunity for Heads of State and Heads of Government of NATO member states to evaluate and provide strategic direction for Alliance activities. The city hosts the Web Summit and is the head office for the Group of Seven Plus (G7+). In 2018 it hosted the Eurovision Song Contest for the first time as well as the Michelin Gala. Partial view of Lisbon, looking towards the Tagus River. Lisbon is located at 38°42′49.75″N 9°8′21.79″W﻿ / ﻿38.7138194°N 9.1393861°W﻿ / 38.7138194; -9.1393861, situated at the mouth of the Tagus River and is the westernmost capital of a mainland European country. The westernmost part of Lisbon is occupied by the Parque Florestal de Monsanto (English: Monsanto Forest Park), a 10 km2 (4 sq mi) urban park, one of the largest in Europe, and occupying ten percent of the municipality. The city occupies an area of 100.05 km2 (39 sq mi), and its city boundaries, unlike those of most major cities, coincide with those of the municipality. The rest of the urbanised area of the Lisbon Metropolitan Area, known generically as Greater Lisbon (Portuguese: Grande Lisboa), extends to the city of Setúbal and includes several administratively defined cities and municipalities, such as Amadora, Queluz, Agualva-Cacém, Odivelas, Loures, Sacavém, Almada, Barreiro, Seixal and Oeiras. Lisbon has a Mediterranean climate (Köppen: Csa) with mild, rainy winters and warm to hot, dry summers. The average annual temperature is 17.4 °C (63.3 °F), 21.3 °C (70.3 °F) during the day and 13.5 °C (56.3 °F) at night. In the coldest month – January – the highest temperature during the day typically ranges from 10 to 18 °C (50 to 64 °F), the lowest temperature at night ranges from 3 to 13 °C (37 to 55 °F) and the average sea temperature is 15 °C (59 °F). In the warmest month – August – the highest temperature during the day typically ranges from 25 to 32 °C (77 to 90 °F), the lowest temperature at night ranges from 14 to 20 °C (57 to 68 °F) and the average sea temperature is 20 °C (68 °F). Among European cities with a population above 500,000, Lisbon ranks with one of the warmest winters (less than Valencia or Málaga) and one of the mildest night time temperatures, from an average of 8.3 °C (46.9 °F) in the coldest month, and 18.6 °C (65.5 °F) in the warmest month. The minimum temperature recorded in Lisbon was −1.2 °C (30 °F) in February 1956 and −1 °C (30 °F) in January 1985. The maximum temperature recorded in Lisbon was 44.0 °C (111.2 °F) on 4 August 2018. Sunshine hours are 2,806 per year, from an average of 4.6 hours of sunshine duration per day in December to an average of 11.4 hours of sunshine duration per day in July. The annual average rainfall is 774 mm (30.5 in), being November the wettest month. Locally, Lisbon's inhabitants may commonly refer to the spaces of Lisbon in terms of historic Bairros de Lisboa (neighbourhoods). These communities have no clearly defined boundaries and represent distinctive quarters of the city that have in common a historical culture, similar living standards, and identifiable architectural landmarks, as exemplified by the Bairro Alto, Alfama, Chiado, and so forth. A view of Alcântara taken from the Port of Lisbon. Although today it is quite central, it was once a mere suburb of Lisbon, comprising mostly farms and country estates of the nobility with their palaces. In the 16th century, there was a brook there which the nobles used to promenade in their boats. During the late 19th century, Alcântara became a popular industrial area, with lots of small factories and warehouses. In the early 1990s, Alcântara began to attract youth because of the number of pubs and discothèques. This was mainly due to its outer area of mostly commercial buildings, which acted as barriers to the noise-generating nightlife (which acted as a buffer to the residential communities surrounding it). In the meantime, some of these areas began to become gentrified, attracting loft developments and new flats, which have profited from its river views and central location. The riverfront of Alcântara is known for its nightclubs and bars. The area is commonly known as docas (docks), since most of the clubs and bars are housed in converted dock warehouses. Alfama, with the churches of S. Vicente de Fora, S. Engrácia, and S. Estêvão, and the Tagus river behind. The oldest district of Lisbon, it spreads down the southern slope from the Castle of São Jorge to the River Tagus. Its name, derived from the Arabic Al-hamma, means fountains or baths. During the Islamic invasion of Iberia, the Alfama constituted the largest part of the city, extending west to the Baixa neighbourhood. Increasingly, the Alfama became inhabited by fishermen and the poor: its fame as a poor neighbourhood continues to this day. While the 1755 Lisbon earthquake caused considerable damage throughout the capital, the Alfama survived with little damage, thanks to its compact labyrinth of narrow streets and small squares. It is an historical quarter of mixed-use buildings occupied by Fado bars, restaurants, and homes with small shops downstairs. Modernising trends have invigorated the district: old houses have been re-purposed or remodelled, while new buildings have been constructed. Fado, the typically Portuguese style of melancholy music, is common (but not obligatory) in the restaurants of the district. The Mouraria, or Moorish quarter, is one of the most traditional neighborhoods of Lisbon, although most of its old buildings were demolished by the Estado Novo between the 1930s and the 1970s. It takes its name from the fact that after the reconquest of Lisbon, the Muslims who remained were confined to this part of the city. In turn, the Jews were confined to three neighbourhoods called "Judiarias"
Praça de Luís de Camões in Lisbon is named after Luís Vaz de Camões, considered the Portuguese language's greatest poet. Bairro Alto (literally the upper quarter in Portuguese) is an area of central Lisbon that functions as a residential, shopping and entertainment district; it is the centre of the Portuguese capital's nightlife, attracting hipster youth and members of various music subcultures. Lisbon's Punk, Gay, Metal, Goth, Hip Hop and Reggae scenes all find a home in the Bairro with its many clubs and bars that cater to them. The crowds in the Bairro Alto are a multicultural mix of people representing a broad cross-section of modern Portuguese society, many of them being entertainment seekers and devotees of various music genres outside the mainstream, yet Fado, Portugal's national music, still survives in the midst of the new nightlife. Aerial view of Downtown Lisbon with the Rua Augusta Arch (Triumphal arch). The heart of the city is the Baixa or city centre; the Pombaline Baixa is an elegant district, primarily constructed after the 1755 Lisbon earthquake, taking its name from its benefactor, Sebastião José de Carvalho e Melo, 1st Marquis of Pombal, who was the minister of Joseph I of Portugal (1750–1777) and a key figure during the Portuguese Enlightenment. Following the 1755 disaster, Pombal took the lead in rebuilding Lisbon, imposing strict conditions and guidelines on the construction of the city, and transforming the organic street plan that characterised the district before the earthquake into its current grid pattern. As a result, the Pombaline Baixa is one of the first examples of earthquake-resistant construction. Architectural models were tested by having troops march around them to simulate an earthquake. Notable features of Pombaline structures include the Pombaline cage, a symmetrical wood-lattice framework aimed at distributing earthquake forces, and inter-terrace walls that were built higher than roof timbers to inhibit the spread of fires. Belém is famous as the place from which many of the great Portuguese explorers set off on their voyages of discovery. In particular, it is the place from which Vasco da Gama departed for India in 1497 and Pedro Álvares Cabral departed for Brazil in 1499. It is also a former royal residence and features the 17th – 18th-century Belém Palace, a former royal residence now occupied by the President of Portugal, and the Ajuda Palace, begun in 1802 but never completed. 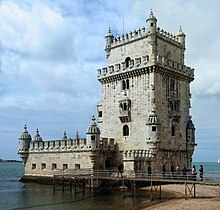 Perhaps Belém's most famous feature is its tower, Torre de Belém, whose image is much used by Lisbon's tourist board. The tower was built as a fortified lighthouse late in the reign of Dom Manuel l (1515–1520) to guard the entrance to the port. It stood on a little island in right side of the Tagus, surrounded by water. Belém's other major historical building is the Mosteiro dos Jerónimos (Jerónimos Monastery), which the Torre de Belém was built partly to defend. Belém's most notable modern feature is the Padrão dos Descobrimentos (Monument to the Discoveries) built for the Portuguese World Fair in 1940. In the heart of Belém is the Praça do Império: gardens centred upon a large fountain, laid out during World War II. To the west of the gardens lies the Centro Cultural de Belém. Belém is one of the most visited Lisbon districts. Here is located the Estádio do Restelo, house of Belenenses. Statue of poet António Ribeiro Chiado, the "Chiado", in the Chiado Square. The Chiado is a traditional shopping area that mixes old and modern commercial establishments, concentrated specially in the Rua do Carmo and the Rua Garrett. Locals as well as tourists visit the Chiado to buy books, clothing and pottery as well as to have a cup of coffee. The most famous café of Chiado is A Brasileira, famous for having had poet Fernando Pessoa among its customers. The Chiado is also an important cultural area, with several museums and theatres, including the opera. Several buildings of the Chiado were destroyed in a fire in 1988, an event that deeply shocked the country. Thanks to a renovation project that lasted more than 10 years, coordinated by celebrated architect Siza Vieira, the affected area has now virtually recovered. The ornate, late 18th-century Estrela Basilica is the main attraction of this district. The church with its large dome is located on a hill in what was at the time the western part of Lisbon and can be seen from great distances. The style is similar to that of the Mafra National Palace, late baroque and neoclassical. The façade has twin bell towers and includes statues of saints and some allegorical figures. São Bento Palace, the seat of the Portuguese parliament and the official residences of the Prime Minister of Portugal and the President of the Assembly of the Republic of Portugal, are in this district. Also in this district is Estrela Park, a favorite with families. There are exotic plants and trees, a duck pond, various sculptures, a children's playground, and many cultural events going on through the year, including outdoor cinema, markets, and music festivals. A view of the Parque das Nações with Vasco da Gama Bridge, Europe's second longest bridge, in the background. Parque das Nações (Park of Nations) is the newest district in Lisbon, having emerged from an urban renewal programme leading to the World Exhibition of Lisbon 1998, also known as Expo'98. The area suffered massive changes giving Parque das Nações a futuristic look. A long lasting legacy of the same, the area has become another commercial and higher end residential area for the city. Central to this is the Gare do Oriente (Orient railway station), one of the main transport hubs of Lisbon for trains, buses, taxis and the metro. Its glass and steel columns are inspired by Gothic architecture, lending the whole structure a visual fascination (especially in sunlight or when illuminated at night). It was designed by the architect Santiago Calatrava from Valencia, Spain. Across the street, through Vasco da Gama Mall, is Parque das Nações (Park of the Nations), site of the 1998 World Expo. The area is pedestrian-friendly with new buildings, restaurants, gardens, the Casino Lisbon, the FIL building (International Exhibition and Fair), the Camões Theatre, as well as the Oceanário de Lisboa (Lisbon Oceanarium), the second largest in the world. The district's Altice Arena has become Lisbon's "jack-of-all-trades" performance arena. Seating 20,000, it has staged events from concerts to basketball tournaments. The Belém Tower, one of the most famous and visited landmarks in Lisbon and throughout Portugal. The city of Lisbon is rich in architecture; Romanesque, Gothic, Manueline, Baroque, Modern and Postmodern constructions can be found all over Lisbon. The city is also crossed by historical boulevards and monuments along the main thoroughfares, particularly in the upper districts; notable among these are the Avenida da Liberdade (Avenue of Liberty), Avenida Fontes Pereira de Melo, Avenida Almirante Reis and Avenida da República (Avenue of the Republic). There are several substantial museums in the city. The most famous ones are the Museu Nacional de Arte Antiga (National Museum of Ancient Art), the National Azulejo Museum, the Museu Calouste Gulbenkian (Calouste Gulbenkian Museum), containing varied collections of ancient and modern art, the Museu Nacional do Traje e da Moda (National Museum of Costume and Fashion), the Berardo Collection Museum (Modern Art) at the Belém Cultural Center, the Museu da Electricidade (Electricity Museum), the Museu Nacional dos Coches (National Coach Museum, containing the largest collection of royal coaches in the world), the National Museum of Natural History and Science, Museum of the Orient, and the Lisbon City Museum. Lisbon's Opera House, the Teatro Nacional de São Carlos, hosts a relatively active cultural agenda, mainly in autumn and winter. Other important theatres and musical houses are the Centro Cultural de Belém, the Teatro Nacional D. Maria II, the Gulbenkian Foundation, and the Teatro Camões. D. Maria II National Theatre, located in the Rossio Square, is one of Portugal's most prestigious venues. The monument to Christ the King (Cristo-Rei) stands on the southern bank of the Tagus River, in Almada. With open arms, overlooking the whole city, it resembles the Corcovado monument in Rio de Janeiro, and was built after World War II, as a memorial of thanksgiving for Portugal's being spared the horrors and destruction of the war. 13 June is Lisbon´s holiday in honour of the city's saint, Anthony of Lisbon (Portuguese: Santo António). Saint Anthony, also known as Saint Anthony of Padua, was a wealthy Portuguese bohemian who was canonised and made Doctor of the Church after a life preaching to the poor. Although Lisbon’s patron saint is Saint Vincent of Saragossa, whose remains are housed in the Sé Cathedral, there are no festivities associated with this saint. The National Coach Museum has the largest collection of royal carriages in the world and is one of Lisbon's most visited institutions. Eduardo VII Park, the second largest park in the city following the Parque Florestal de Monsanto (Monsanto Forest Park), extends down the main avenue (Avenida da Liberdade), with many flowering plants and greenspaces, that includes the permanent collection of subtropical and tropical plants in the winter garden (Portuguese: Estufa Fria). Originally named Parque da Liberdade, it was renamed in honour of Edward VII of England who visited Lisbon in 1903. Lisbon is home every year to the Lisbon Gay & Lesbian Film Festival, the Lisboarte, the DocLisboa – Lisbon International Documentary Film Festival, the Festival Internacional de Máscaras e Comediantes, the Lisboa Mágica – Street Magic World Festival, the Monstra – Animated Film Festival, the Lisbon Book Fair, the Peixe em Lisboa – Lisbon Fish and Flavours, and many others. Lisbon has two sites listed by UNESCO as a World Heritage Site: Belém Tower and Jerónimos Monastery. Furthermore, in 1994, Lisbon was the European Capital of Culture and in 1998 organised the Expo '98 (1998 Lisbon World Exposition). The Calouste Gulbenkian Foundation is one of the wealthiest foundations in the world and houses one of the largest private collections of antiquaries and art in the world, within the Gulbenkian Museum. Lisbon is also home to the Lisbon Architecture Triennial, the Moda Lisboa (Fashion Lisbon), ExperimentaDesign – Biennial of Design and LuzBoa – Biennial of Light. In addition, the mosaic Portuguese pavement (Calçada Portuguesa) was born in Lisbon, in the mid-1800s. The art has since spread to the rest of the Portuguese Speaking world. The city remains one of the most expansive examples of the technique, nearly all walkways and even many streets being created and maintained in this style. In terms of Portuguese cities, Lisbon was considered the most livable in a survey of living conditions published yearly by Expresso. In May 2018, the city hosted the 63rd edition of the Eurovision Song Contest, after the victory of Salvador Sobral with the song "Amar pelos dois" in Kyiv on 13 May 2017. The historical population of the city was around 35,000 in 1300 AD. Up to 60,000 in 1400 AD, and rising to 70,000 in 1500 AD. Between 1528–1590 the population went from 70,000 to 120,000. 150,000 in 1600 AD, and almost 200,000 in 1700 AD. The Lisbon Metropolitan Area incorporates two NUTS III (European statistical subdivisions): Grande Lisboa (Greater Lisbon), along the northern bank of the Tagus River, and Península de Setúbal (Setúbal Peninsula), along the southern bank. These two subdivisions make for the Região de Lisboa (Lisbon Region). The population density of the city itself is 6,458 inhabitants per square kilometre (16,730/sq mi). Lisbon has 552,700 inhabitants within the administrative center on the area of only 100.05 km2 Administratively defined cities that exist in the vicinity of the capital are in fact part of the metropolitan perimeter of Lisbon. The urban area has a population of 2,666,000 inhabitants, being the eleventh largest urban area in the European Union after Paris, London, Ruhr area, Madrid, Milan, Barcelona, Berlin, Rome, Naples and Athens. The whole metropolis of Lisbon (metropolitan area) has about 3 million inhabitants. According to official government data, the Lisbon Metropolitan Area has 3,121,876 inhabitants. Other sources also show a similar number, according to the Organisation for Economic Co-operation and Development – 2,797,612 inhabitants; according to the Department of Economic and Social Affairs of the United Nations – 2,890,000; according to the European Statistical Office Eurostat – 2,839,908; according to the Brookings Institution has 2,968,600 inhabitants. The Port of Lisbon, one of the busiest in Europe. The Lisbon region is the wealthiest region in Portugal and it is well above the European Union's GDP per capita average – it produces 45% of the Portuguese GDP. Lisbon's economy is based primarily on the tertiary sector. Most of the headquarters of multinationals operating in Portugal are concentrated in the Grande Lisboa Subregion, specially in the Oeiras municipality. The Lisbon Metropolitan Area is heavily industrialized, especially the south bank of the Tagus river (Rio Tejo). The Lisbon region is rapidly growing, with GDP (PPP) per capita calculated for each year as follows: €22,745 (2004) – €23,816 (2005) – €25,200 (2006) – €26,100 (2007). The Lisbon metropolitan area had a GDP amounting to $96.3 billion, and $32,434 per capita. In 2016, Lisbon became the permanent host city of the Web Summit, the world's largest tech conference. The country's chief seaport, featuring one of the largest and most sophisticated regional markets on the Iberian Peninsula, Lisbon and its heavily populated surroundings are also developing as an important financial centre and a dynamic technological hub. Automobile manufacturers have erected factories in the suburbs, for example, AutoEuropa. Lisbon has the largest and most developed mass media sector of Portugal, and is home to several related companies ranging from leading television networks and radio stations to major newspapers. The Caixa Geral de Depósitos is Portugal's largest bank. The Euronext Lisbon stock exchange, part of the pan-European Euronext system together with the stock exchanges of Amsterdam, Brussels and Paris, is tied with the New York Stock Exchange since 2007, forming the multinational NYSE Euronext group of stock exchanges. Lisbonite industry has very large sectors in oil, as refineries are found just across the Tagus, textile mills, shipyards and fishing. Before Portugal's sovereign debt crisis and an EU-IMF rescue plan, for the decade of 2010 Lisbon was expecting to receive many state funded investments, including building a new airport, a new bridge, an expansion of 30 km (18.64 mi) underground, the construction of a mega-hospital (or central hospital), the creation of two lines of a TGV to join Madrid, Porto, Vigo and the rest of Europe, the restoration of the main part of the town (between the Marquês de Pombal roundabout and Terreiro do Paço), the creation of a large number of bike lanes, as well as modernization and renovation of various facilities. Lisbon was the 18th most "livable city" in the world in 2015 according to lifestyle magazine Monocle. Lisbon’s iconic electric trams crossing in the downtown area. The Lisbon Metro connects the city centre with the upper and eastern districts and also reaches some suburbs that are part of the Lisbon Metropolitan Area, such as Amadora and Loures. It is the fastest way to get around the city and it provides a good number of interchanging stations with other types of transportation. From the Lisbon Airport station to the city centre it may take roughly 25 mins. As of 2018, the Lisbon Metro comprises four lines, identified by individual colours (blue, yellow, green and red) and 56 stations, with a total length of 44.2 km. Several expansion projects have been proposed, being the most recent the transformation of the Green Line into a circular line and the creation of two more stations (Santos and Estrela). A traditional form of public transport in Lisbon is the tram. Introduced in the 19th century, the trams were originally imported from the US, and called the americanos. The earliest trams can still be seen in the Museu da Carris (the Public Transport Museum). Other than on the modern Line 15, the Lisbon tramway system still employs small (four wheel) vehicles of a design dating from the early twentieth century. These distinctive yellow trams are one of the tourist icons of modern Lisbon, and their size is well suited to the steep hills and narrow streets of the central city. Gare do Oriente train station is an intermodal station that links the Lisbon metro with the city's Carris buses as well as outstation bus and train lines. There are four commuter train lines departing from Lisbon: the Cascais, Sintra and Azambuja lines (operated by CP – Comboios de Portugal), as well as a fourth line to Setúbal (operated by Fertagus) crossing the Tagus river, over the 25 de Abril Bridge. The major railway stations are Santa Apolónia, Rossio, Gare do Oriente, Entrecampos, and Cais do Sodré. Local bus service within Lisbon is operated by Carris. 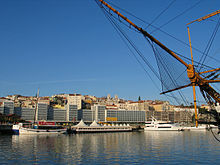 There are other commuter bus services from the city (connecting cities outside Lisbon, and connecting these cities to Lisbon): Vimeca, Rodoviária de Lisboa, Transportes Sul do Tejo, Boa Viagem, Barraqueiro are the main ones, operating from different terminals in the city. Lisbon is connected to its suburbs as well as throughout Portugal by an extensive motorway network. There are three circular motorways around the city; the 2ª Circular, the IC17 (CRIL), and the A9 (CREL). The 25 de Abril Bridge carries 6 vehicular lanes and 2 train lines over the Tagus river connecting Lisbon with Almada. The 25 de Abril Bridge, inaugurated (as Ponte Salazar) on 6 August 1966, and later renamed after the date of the Carnation Revolution, was the longest suspension bridge in Europe. The Vasco da Gama Bridge, inaugurated in May 1998 is, at 17.2 km (10.7 mi), the longest bridge in Europe. The foundations for a third bridge across the Tagus have already been laid, but the overall project has been postponed due to the economic crisis in Portugal and all of Europe. Another way of crossing the river is by taking the ferry. The company is Transtejo & Soflusa, which operates from different points in the city to Cacilhas, Seixal, Montijo, Porto Brandão and Trafaria under the brand Transtejo and to Barreiro under the brand Soflusa. Humberto Delgado Airport is located within the city limits. It is the headquarters and hub for TAP Portugal as well as a hub for Easyjet, Azores Airlines, Ryanair, EuroAtlantic Airways, White Airways, and Hi Fly. A second airport has been proposed, but the project has been put on hold because of the Portuguese and European economic crisis, and also because of the long discussion on whether a new airport is needed. However, the last proposal is military air base in Montijo that would be replaced by a civil airport. So, Lisbon would have two airports, the current airport in north and a new in the south of the city. Cascais Aerodrome, 20 km West of the city centre, in Cascais, offers commercial domestic flights. The average amount of time people spend commuting with public transit in Lisbon, for example to and from work, on a weekday is 59 min. 11.5% of public transit riders, ride for more than 2 hours every day. The average amount of time people wait at a stop or station for public transit is 14 min, while 23.1% of riders wait for over 20 minutes on average every day. The average distance people usually ride in a single trip with public transit is 6 km, while 10% travel for over 12 km in a single direction. The rectory and main campus of the New University of Lisbon. Lisbon has a well-developed education system of universities, kindergartens and schools. In Greater Lisbon area, particularly in the Portuguese Riviera, an area popular with expats and foreign nationals, there are numerous international schools, including the Carlucci American International School of Lisbon (only American school in Portugal), Saint Julian's School (British), Saint Dominic's International School (British), Deutsche Schule Lissabon (German), Instituto Español Giner de los Ríos (Spanish), and Lycée Français Charles Lepierre (French). In the city, there are three public universities and a university institute in Lisbon. The University of Lisbon, which is the largest university in Portugal, was created in 2013 with the union of the Technical University of Lisbon and the Classical University of Lisbon (which was known as the University of Lisbon). 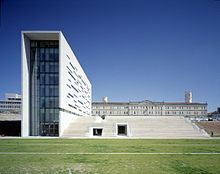 The New University of Lisbon, founded in 1973, is another public university in Lisbon and is known internationally by its Nova School of Business and Economics (Nova SBE),its economics and management faculty. The third public university is Universidade Aberta. Additionally, there's ISCTE - Lisbon University Institute (founded in 1972), a university institute that provides degrees in all academic disciplines. Major private institutions of higher education include the Portuguese Catholic University, focused on law and management, as well as the Lusíada University, the Universidade Lusófona, and the Universidade Autónoma de Lisboa, among others. The total number of enrolled students in higher education in Lisbon was, for the 2007–2008 school year, of 125,867 students, of whom 81,507 in the Lisbon's public institutions. Lisbon is home to the Biblioteca Nacional de Portugal, the Portuguese national library, with over 3 million books and manuscripts. The library has some rare books and manuscripts, such as an original Gutenberg Bible and original books by Erasmus, Christophe Platin and Aldus Manutius. Another relevant library is the Torre do Tombo National Archive, one of the most important archives in the world, with over 600 years and one of the oldest active Portuguese institutions. There are, among several others, the Arquivo Histórico Ultramarino and the Arquivo Histórico Militar. Lisbon has a long tradition in sports. It hosted several matches, including the final, of the UEFA Euro 2004 championship. The city also played host to the final of the 2001 IAAF World Indoor Championships and the European Fencing Championships in 1983 and 1992, as well as the 2003 World Men's Handball Championship, and the 2008 European Judo Championships. From 2006 to 2008, Lisbon was the starting point for the Dakar Rally. The city hosted the 2014 UEFA Champions League Final. In 2008 and 2016, the city hosted the European Triathlon Championships. Lisbon has a leg at the Volvo Ocean Race. The city hosts three association football clubs in Portugal's highest league, the Primeira Liga. Sport Lisboa e Benfica, commonly known as just Benfica, has won 36 league titles in addition to two European Cups. Lisbon's second-most successful club is Sporting Clube de Portugal (commonly known as Sporting and mistankenly referred to as Sporting Lisbon in the English-speaking world), winner of 18 league titles and the UEFA Cup Winners' Cup. A third club, C.F. Os Belenenses (commonly Belenenses or Belenenses Lisbon), based in the Belém quarter, has solely won one league title. Other major clubs in Lisbon include Atlético, Casa Pia, and Oriental. Lisbon has two UEFA category four stadiums; Benfica's Estádio da Luz (Stadium of Light), with a capacity of over 65,000 and Sporting's Estádio José Alvalade, with a capacity of over 50,000. There is also Belenenses' Estádio do Restelo, with a capacity of over 30,000. The Estádio Nacional, in nearby Oeiras, has a capacity of 37,000 and was used exclusively for Portuguese international football matches and cup finals until the construction of larger stadia in the city. It held the 1967 European Cup Final. Other sports, such as futsal, handball, basketball, roller hockey, volleyball and rugby union are also popular; the latter's national stadium is in Lisbon. There are many other sport facilities in Lisbon, ranging from athletics to sailing to golf to mountain-biking. Lisboa and Troia golf course are two of many stunning golf courses located in Lisbon. Every March the city hosts the Lisbon Half Marathon, while in September the Portugal Half Marathon. ^ Wells, John C. "Portuguese". Retrieved 17 June 2012. ^ "The World According to GaWC 2010". Globalization and World Cities Research Network. Retrieved 23 November 2012. ^ "The World According to GaWC 2010". Globalization and World Cities Study Group and Network, Loughborough University. Retrieved 3 March 2009. ^ "Alta Velocidade em Síntese". Rave.pt. Archived from the original on 4 October 2010. Retrieved 21 November 2010. ^ "Euromonitor International's Top 100 City Destinations Ranking"
^ "Global city GDP rankings 2008–2025". Pricewaterhouse Coopers. Archived from the original on 13 May 2011. Retrieved 16 December 2009. ^ Various, compiled (1780). An Universal History, From the Earliest Accounts to the Present Time. p. 345. ^ Adrien Delmas; Nigel Penn (20 January 2012). Written Culture in a Colonial Context: Africa and the Americas 1500–1900. BRILL. p. 348. ISBN 978-90-04-22524-4. ^ Vincent Barletta (15 May 2010). Death in Babylon: Alexander the Great and Iberian Empire in the Muslim Orient. University of Chicago Press. p. 39. ISBN 978-0-226-03739-4. ^ a b Peter Whitfield (2005). Cities of the World: A History in Maps. University of California Press. p. 99. ISBN 978-0-520-24725-3. ^ Rodrigo Banha da Silva (September 2013). "A ocupação da idade do bronze final da Praça da Figueira (Lisboa): novos e velhos dados sobre os antecedentes da cidade de Lisboa" (PDF). Cira Arqueologia. Cira Arqueologia II (in Portuguese). Museu da Rede Portuguesa de Museus (2, Tejo, palco de interação entre Indígenas e Fenícios). Archived from the original (PDF) on 21 June 2014. Retrieved 21 June 2014. ^ Carlos Gómez Bellard (2003). Ecohistoria del paisaje agrario: La agricultura fenicio-púnica en el Mediterráneo. Universitat de València. p. 213. ISBN 978-84-370-5508-4. ^ Ana Margarida Arruda (2002). Los fenicios en Portugal: fenicios y mundo indígena en el centro y sur de Portugal (siglos VIII-VI a.C.). Carrera Edició. pp. 113–115. ISBN 978-84-88236-11-1. ^ John Laidlar (1997). Lisbon. Clio Press. p. 63. ISBN 978-1-85109-268-0. ^ Nathan Laughlin Pilkington (2013). "An Archaeological History of Carthaginian Imperialism". Academic Commons, Columbia.edu. Columbia University. p. 170. Retrieved 19 August 2014. ^ David Wright; Patrick Swift (1 January 1971). Lisbon: a portrait and a guide. Barrie and Jenkins. p. 150. ISBN 978-0-214-65309-4. ^ Wachsmann, Shelley; Dunn, Richard K.; Hale, John R.; Hohlfelder, Robert L.; Conyers, Lawrence B.; Ernenwein, Eileen G.; Sheets, Payson; Blot, Maria Luisa Pienheiro; Castro, Filipe; Davis, Dan (September 2009). "The Palaeo-Environmental Contexts of Three Possible Phoenician Anchorages in Portugal" (PDF). International Journal of Nautical Archaeology. Blackwell Publishing Ltd. 38 (2): 221–253. doi:10.1111/j.1095-9270.2009.00224.x. Archived from the original (PDF) on 13 October 2016. ^ Pedro Telhado Pereira; Maria Eugénia Mata (6 December 2012). Urban Dominance and Labour Market Differentiation of a European Capital City: Lisbon 1890–1990. Springer Science & Business Media. p. 123. ISBN 978-94-011-5382-9. ^ Pires, Helio. "Sigurđr's Attack on Lisbon: Where Exactly?" In Viking and Medieval Scandinavia 8 (2012) – Turnhout, Belgium : Brepols Publishers, c = 2012, pp. 199–205. ^ EncyclopædiaBritannica. "John IV (king of Portugal)". king of Portugal from 1640 as a result of the national revolution or restoration, which ended 60 years of Spanish rule. ^ Pereira, A.S. (March 2006). "The Opportunity of a Disaster: The Economic Impact of the Lisbon 1755 Earthquake" (PDF). Centre for Historical Economics and Related Research at York, York University. Retrieved 21 November 2010. ^ "The Economic Impact of the Lisbon 1755 Earthquake – p. 8, estimates a population of 200,000" (PDF). March 2006. Retrieved 21 November 2010. ^ "Historical Depictions of the 1755 Lisbon Earthquake, citing an unreferenced estimate of 275,000". Nisee.berkeley.edu. 12 November 1998. Archived from the original on 11 March 2011. Retrieved 21 November 2010. ^ "Historical Depictions of the 1755 Lisbon Earthquake". Nisee.berkeley.edu. 12 November 1998. Archived from the original on 11 March 2011. Retrieved 21 November 2010. ^ "Portugal". The Virtual Jewish History Tour. ^ "Welcome to the official global voting platform of". New7Wonders. Retrieved 8 July 2009. ^ "World Map of Köppen−Geiger Climate Classification". Archived from the original on 6 September 2010. ^ a b Lisbon average sea temperature – seatemperature.org. ^ "G.Coutinho and Tapada weather stations meassure the Lisbon highest temperature record". 5 August 2018. ^ "Monthly Averages for Lisbon, Portugal (1981–2010)". Instituto de Meteorologia. Retrieved 10 August 2012. ^ Diário da República. "Law nr. 56/2012, pages 6454–6460" (pdf) (in Portuguese). Retrieved 20 November 2014. ^ Joaquim Carvalho (2007). Religion and Power in Europe: Conflict and Convergence. Edizioni Plus. p. 38. ISBN 978-88-8492-464-3. ^ Michael Colvin (2008). The Reconstruction of Lisbon: Severa's Legacy and the Fado's Rewriting of Urban History. Associated University Presse. p. 98. ISBN 978-0-8387-5708-6. ^ François Soyer (15 October 2007). The Persecution of the Jews and Muslims of Portugal: King Manuel I and the End of Religious Tolerance (1496–7). BRILL. p. 41. ISBN 90-04-16262-3. ^ Patrick O'Flanagan (1 January 2008). Port Cities of Atlantic Iberia, C. 1500–1900. Ashgate Publishing, Ltd. p. 147. ISBN 978-0-7546-6109-2. ^ "Official web-site". Lisbon Gay and Lesbian Film Festival. Retrieved 6 November 2006. ^ "doclisboa 2009". Doclisboa.org. Retrieved 8 July 2009. ^ "Feira do Livro de Lisboa". Feiradolivrodelisboa.pt. Retrieved 30 April 2010. ^ "Peixe em Lisboa". Peixemlisboa.com. Retrieved 8 July 2009. ^ "Trienal de Arquitectura de Lisboa". trienaldelisboa.com. Retrieved 8 July 2009. ^ "ModaLisboa – LisboaFashionWeek – Semana oficial da moda portuguesa". Modalisboa.pt. Retrieved 8 July 2009. ^ "Experimentadesign". Experimentadesign.pt. Retrieved 8 July 2009. ^ "Luzboa 2008". Luzboa.com. Retrieved 8 July 2009. ^ Paul Bairoch (1991). Cities and Economic Development: From the Dawn of History to the Present. University of Chicago Press. p. 180. ISBN 978-0-226-03466-9. ^ Luis Frois SJ (2014). The First European Description of Japan, 1585: A Critical English-Language Edition of Striking Contrasts in the Customs of Europe and Japan by Luis Frois, S.J. Routledge. p. 194. ISBN 978-1-317-91781-6. ^ Richard W. Mansbach; Kirsten L. Taylor (2013). Introduction to Global Politics. Routledge. p. 40. ISBN 978-1-136-51738-9. ^ "GDP per inhabitant in 2004" (PDF). Eurostat. Archived from the original (PDF) on 26 March 2009. Retrieved 17 November 2012. ^ "GDP per inhabitant in 2005" (PDF). Eurostat. Archived from the original (PDF) on 16 February 2008. Retrieved 17 November 2012. ^ "GDP per inhabitant in 2006" (PDF). Eurostat. Archived from the original (PDF) on 25 March 2009. Retrieved 17 November 2012. ^ "GDP per inhabitant in 2007" (PDF). Eurostat. Archived from the original (PDF) on 9 November 2014. Retrieved 17 November 2012. ^ "Global Metro Monitor GDP 2014". Brookings Institution. ^  Information from Carris, Lisbon transportation company. ^ "vimeca". Vimeca.pt. Retrieved 8 July 2009. ^ "Bem vindo ao site da Rodoviária de Lisboa". Rodoviária de Lisboa. Retrieved 8 July 2009. ^ "TST – Transportes Sul do Tejo". Tsuldotejo.pt. Retrieved 8 July 2009. ^ "Boa Viagem". Boa-viagem.pt. Retrieved 8 July 2009. ^ "Barraqueiro Transportes". Barraqueirotransportes.pt. Retrieved 8 July 2009. ^ "Suspension bridge". Encyclopædia Britannica. 15 November 2016. Retrieved 30 January 2018. ^ "The highest, tallest, longest and oldest bridges in the world". The Telegraph. Retrieved 30 January 2018. ^ "Transtejo e Soflusa". Transtejo.pt. Retrieved 8 July 2009. ^ "Lisboa Public Transportation Statistics". Global Public Transit Index by Moovit. Retrieved 19 June 2017. ^ "Statistics on enrollment from GPEARI/Ministry of Science, Technology and Higher Education (MCES) (Excel spreadsheet, 2007/08 school year)". Estatistics.gpeari.mctes.pt. Archived from the original on 23 June 2009. Retrieved 17 November 2012. ^ a b c d e f g h i j k l m n o p q r "Geminações de Cidades e Vilas: Lisbon" [Twinning Cities and Towns: Lisbon] (in Portuguese). Lisbon, Portugal: Associação Nacional de Municípios Portugueses [pt] [National Association of Portuguese Municipalities]. Retrieved 12 March 2015. ^ a b c d e f g h i j k l m n o p q r s t u v w x y "Acordos de geminação, de cooperação e de amizade" [Twinning agreements, cooperation and friendship] (in Portuguese). Lisbon, Portugal: Camara Municipal de Lisboa. Archived from the original on 31 October 2013. Retrieved 12 March 2015. ^ The City of Lisbon; Bangkok Metropolitan Administration (19 July 2016). "Friendship And Co-Operation Agreement between The City of Lisbon Portuguese Republic and The Bangkok Metropolitan Administration Kingdom of Thailand" (PDF). ^ "Mapa Mundi de las ciudades hermanadas" (council webpage). Ayuntamiento de Madrid. ^ "Twin Cities plan will boost Malacca". New Straits Times. Retrieved 9 July 2013. ^ "Declaración de Hermanamiento múltiple y solidario de todas las Capitales de Iberoamérica (12-10-82)" (PDF). 12 October 1982. Archived from the original (PDF) on 10 May 2013. Retrieved 12 March 2015.